The story of Robin Hood has been presented to us multiple times over the years, with the most famous one being the version with Kevin Costner in the lead. Of course many also know the Disney version, as well as the parody, Robin Hood: Men in Tights. 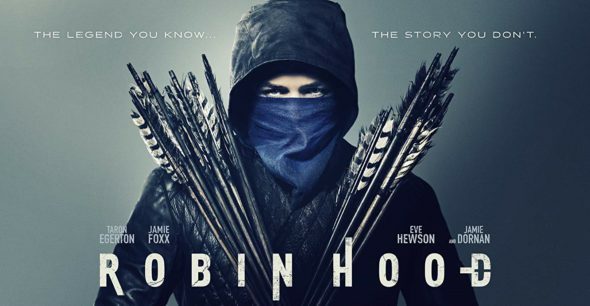 We didn’t really expect a new tale of Robin Hood, as in 2010 a version starring Russell Crowe was already made, so it hasn’t been a decade since the last adaptation of the story. While a story such as this is always welcome, we feel that this one should have stayed in the oven a bit longer. 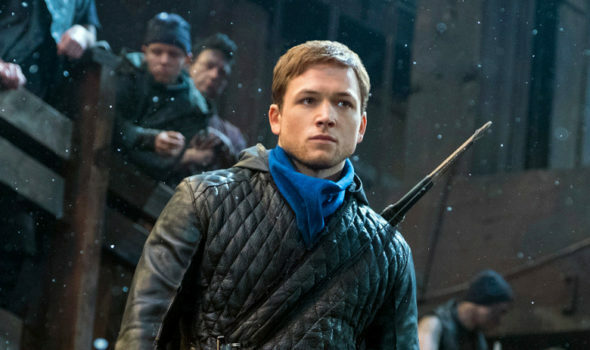 Robin of Loxley (Taron Egerton) seemingly has it all, he’s a wealthy lord and he meets the love of his life, Marian (Eve Hewson) at a young age. They feel as if they can conquer the world together, until Robin is shipped off to war, to fight in the crusades. Four years pass, and Robin is an excellent fighter in the war, but when he sees his fellow fighters butcher innocent and unarmed Arabs for no reason, he can’t sit by idly and do nothing. 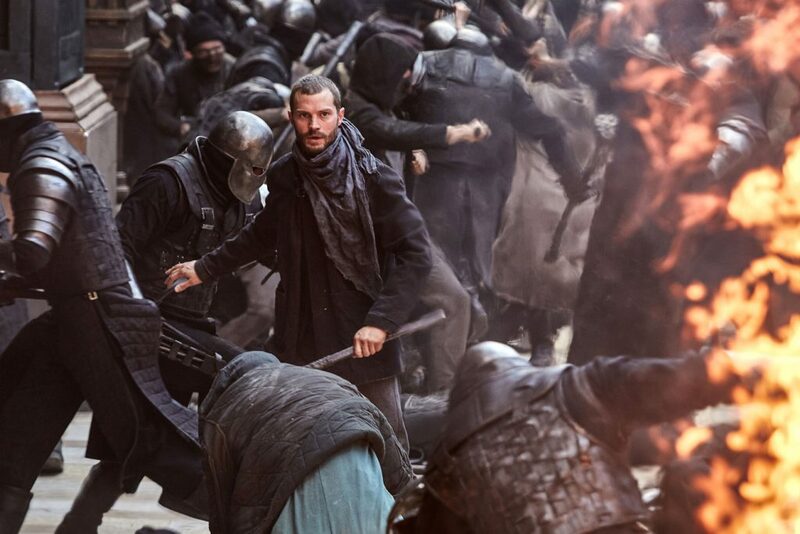 He tries to save the son of Yahya (Jamie Foxx), as the young boy did no harm. Sadly, his attempt to save the young man is foiled by his so-called allies, who end up wounding Robin to ship him back home. Yahya escapes and makes his way onto Robin’s boat. Upon Robin’s return he notices that his house is a dump and that all his wealth is gone, as well as his wife. 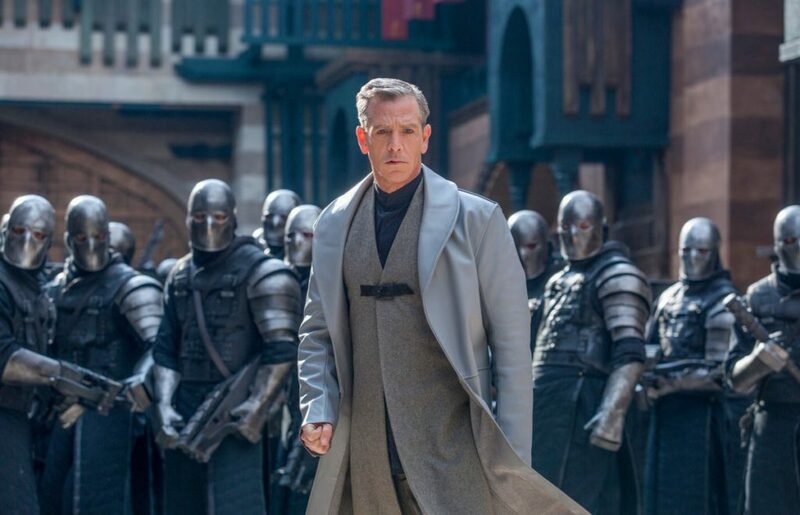 He visits friar Tuck (Tim Minchin), a good friend of the family, and learns that sheriff Nottingham (Ben Mendelsohn) has stripped Robin of all his property to raise money for the war. Before Tuck could tell Robin, Robin sees Marian with a new man, as everybody thought Robin was dead. While Robin wants to teach the sheriff a lesson, he is stopped by Yahya to show him a better way of exacting his revenge on the corrupt sheriff, by becoming a vigilante who steals from the rich to distribute the money amongst those who are constantly being taxed. The flow of the movie is a bit odd, with the introduction being lengthy enough to paint a proper picture, to quickly follow-up with the situation at Robin’s home to a very action-packed second half of the movie. While this isn’t all that bad, it feels like a few details have been forgotten, especially since Robin already met Marian and friar Tuck before being shipped to war. Both characters feel extremely flat, and even though they are of a rather big importance, they remain flat and somewhat dull until the end of the movie. Other problems lie in the fact that they tried to modernize the movie a bit too much, making it feel too modern for a tale such as this. The special effects used are over the top, the camera viewpoints are often annoying, the visuals can turn a bit blurry and everything feels a bit wishy-washy when looking at the bigger picture. 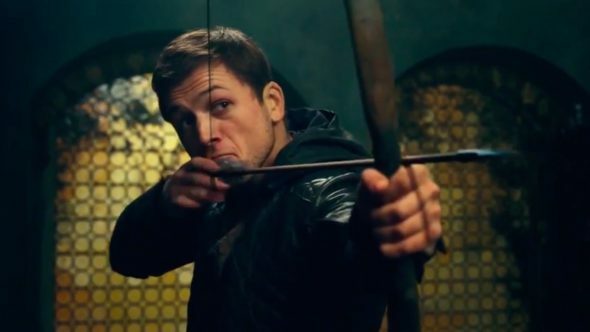 In some ways it would have been better to have a Robin Hood in a more modern era, as it would have matched the techniques that were used better. As it stands now, it all looks like a big collection of different moviemaking techniques that were tried out for this film, without it actually becoming a proper whole. It’s actually hard to describe the acting performances in this movie, as many of the characters feel a bit out of place. Taron Egerton who plays Robin of Loxley does so with a certain conviction, but throughout the movie we can’t help but feel that he’s too young or at least looks too young to play the part of Robin Hood. Jamie Foxx plays Yahya/John, and also does so convincingly but again the character feels a bit out of place, as well as his motivation to train Robin. We realize that Robin tried to do good for the Moor but we don’t immediately see why he would go to these lengths in order to help Robin. Overall all characters feel like their story remains on the surface, rather than become something meaningful. The sheriff is played by Ben Mendelsohn and might just feel like the best character in the movie, albeit yet again without any real depth. Overall the acting performances suffice but when you have to work with a wonky plot, poor writing and over the top filming techniques, there is only so much the cast can save. The DVD edition of this new iteration of Robin Hood comes with little to no extras. You’ll have about 15 minutes worth of the extra content, which is pretty much a collection of outtakes and deleted scenes, which are certainly welcome, but as this movie relies heavily on special effects, a making of would have been more useful. Perhaps even a commentary about why the story has been adapted to fit the narrative of this film would have also been nice to see when buying the physical edition of this movie. It’s hard to score a movie such as this, as the overall story has been one that withstood the test of time, but the alterations to this one rather do it harm than justice. The cast feels a bit out of place and the entire modern package just feels like a tangle of different ideas that were never properly executed. The entire movie feels like a project instead of an actual properly finished end product. At the end of the film it’s clear that this one would need a sequel, but we can easily say that we hope that this iteration of Robin Hood slowly fades away to the background, allowing the older movies to shine.